Pre-orders are now being taken for the Revell 1:72 scale Sukhoi T-50 Stealth combat aircraft, with deliveries of the kit due to start on April 7, 2012. Strictly speaking, we are looking at the PAK FA, which is the flying prototype for the production T-50, due to start rolling out of the factories from 2015. 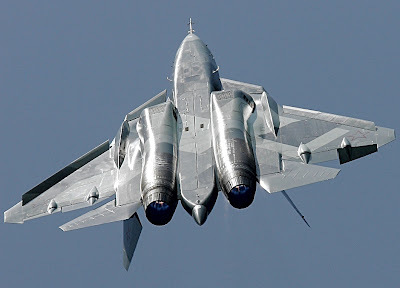 The handsome machine was shown off last August, at the 2011 Russian International Air Show, displaying advanced features that include electronically-controlled vectored engine nozzles, which adjust the angle of the jet exhausts to boost manoeuvrability and improve handling. 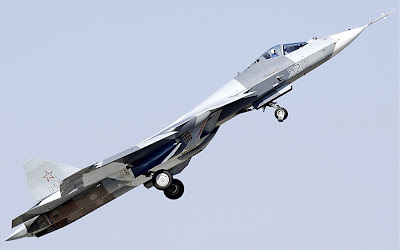 Nano-tech surface materials are used, and Sukhoi claims these enable: “85 percent stealth success” whatever that means! Let’s just say the T-50 - being co-produced with India, incidentally - may be a worthy combat competitor for the current Top Gun, the US F-22 Raptor. Like the Raptor, the T-50 will house weapons internally, as ordnance hung under the wings and fuselage shows up well on enemy radar screens. As planned, the aircraft will have a top speed of more than 2000 km/h (1250 mph). The Revell model (we’re not sure, but it could be a version of the existing Zvezda release above) looks to be a decent 1:72 scale kit, containing 72 components. Revell says there’ll be a detailed cockpit, with canopy that can be displayed open or closed. 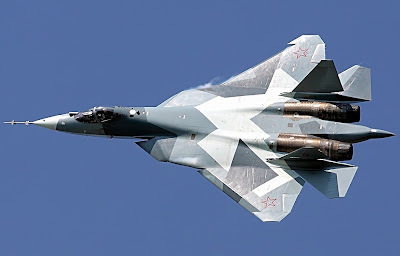 There will be two pilot figures, one sitting, one standing, and - a nice touch - an access ladder, which will be handy for modelmakers wishing to show the T-50 in a static ground pose. 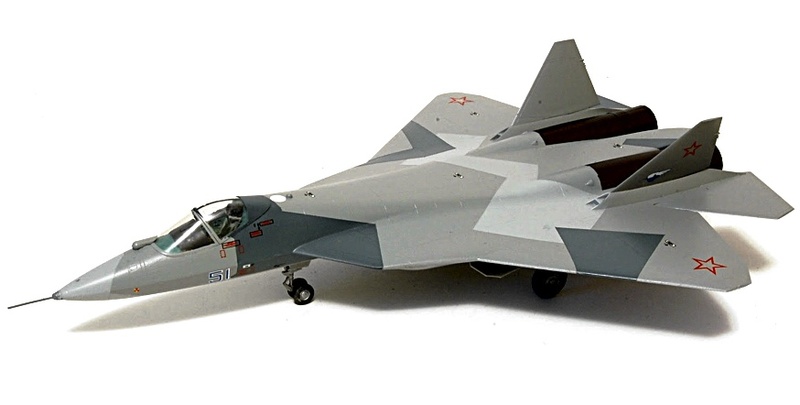 When assembled the Revell Sukhoi T-50 will have a wingspan of 198 mm (7.8 in) and length of 293 mm (11.5 in). 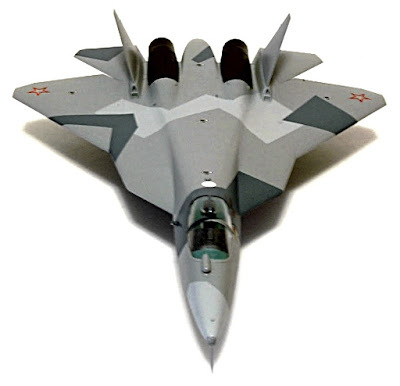 The assembled T-50 pix are shown courtesy the website 72 Land, and show the Zvezda T-50 PAK FA. It’s a neat enough kit, and as assembled here would look good in any collection. There are detailed comments over at 72 Land, link below. Once we have our hot little hands on the Revell kit, we'll bring update information. Meantime, we’re looking forward to this model of an important aircraft that will see widespread service. 1:72 is a somewhat unsung scale these days, so it’s good to see an addition to the ranks. Having said that, we’re ready for a 1:32 scale biggie, with opening weapon bays, moveable engine nozzles, and max detail throughout. Plenty of Sukhoi kits, including the Zvezda T-50 PAK FA here.